Attendees of the symposium held by the International Society for Rapid Response Systems and Medical Emergency Teams are all clinicians that intuitively recognise the problems that Nervecentre was designed to solve. The two day event is based around presentations and workshops sharing best practice to ensure that acute hospitals have the skills, processes, resources and tools to recognise deteriorating patients; and respond quickly to each deteriorating patient to prevent further deterioration. 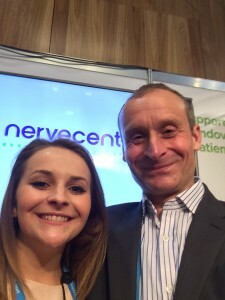 Nervecentre attended the 2015 conference in Amsterdam- it was clear then that our ability to recognise deterioration, sepsis or other conditions; automatically escalate to the right clinicians and teams; and track the response of those teams was highly relevant to attendees. Nervecentre’s ongoing investment in Australia and the success of our attendance in 2015 justified our plan to attend- but exhibiting at a conference is always a risk. Clinicians attend to catch-up on the latest practices and to network with their peers. Exploring industry stands during the coffee breaks is not always a priority- as suppliers you are never sure what to expect. Competitors used Nervecentre’s mobile application to select a patient from their patient list; enter a full set of observations; recognise a deteriorating patient and escalate to the right clinician. 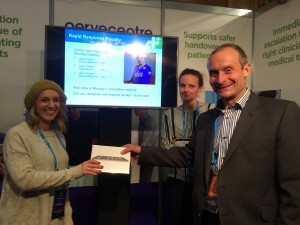 Each competitor was timed from selecting a patient until the doctor received a deteriorating patient alert: the fastest time over the two days won the Respect and Adulation of their Peers, and an iPad. Helping Jet-setting Jim on stand-duty was daughter Amy- flown in from a backpacker’s hostel in New Zealand to act as crowd-control, official timer and light entertainment. An inspired combination of the Trueman Show and the Krypton Factor. 34 attendees from 8 different countries entered the competition- all managed to escalate their deteriorating patient to Doctor Amy without needing to Bleep, phone or shout across a crowded exhibition hall. Many more watched Nervecentre in action but cited stage-fright as a reason not to enter. The whispered conversations in the corridors of the Melbourne Conference Centre were all “how fast were you?”, “Gosh that Nervecentre stuff would greatly improve patient safety in my hospital” or “Yummy, lunch looks nice”. Strikingly a number of ISRRS Board Members thanked us for attending and supporting the symposium, with strong encouragement for Nervecentre to demonstrate our next developments at next year’s event in Chicago. Our mobile first approach to patient safety, recognition of the importance of targeted and managed escalations, and clinical communication platform all resonated well across all geographies and healthcare systems. Hospital- and beat her colleague Alice Wickett (49 seconds) into third place. Second place and only one second behind Alana in 44 seconds was Karin Gerber, from Royal Berkshire NHS Foundation Trust. Karin was the first competitor on the first day and set a high standard from the start. Do you think you could recognise and escalate a deteriorating patient quicker than Alana? Implement Nervecentre in your hospital tomorrow and give it a go.